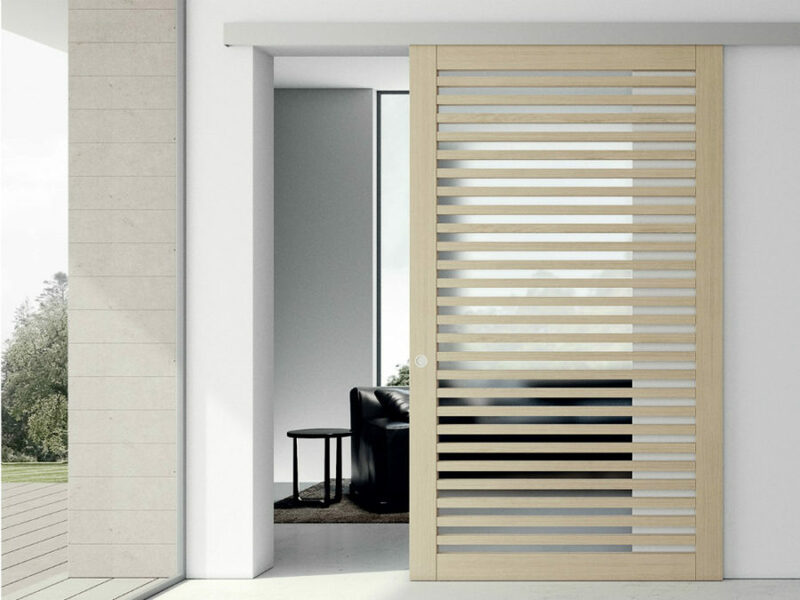 Modern doors go well beyond simple wooden sheets we’re used to. New ideas are all about making them less visible and yet more decorative. 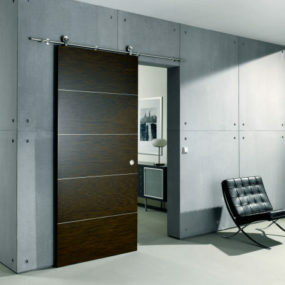 Contemporary doors come in a wide variety of materials and designs as well as with different mechanisms. Many of interior designers opt for door systems that separate spaces physically but retain visual communication between areas. Others choose hidden sliding door mechanisms to maximize precious space, and keep them out of the way when they’re open. 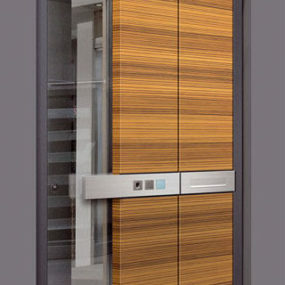 This Linvisibile pocket door is such an example. It’s decorative when it’s closed, and invisible when open. No space is wasted. 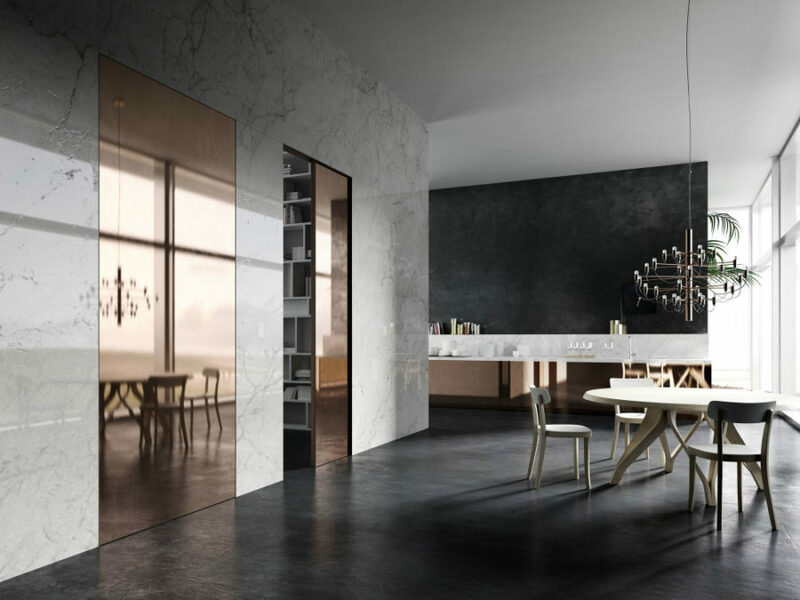 These interior door designs can be made in tune with the walls or in contrasting materials. They retract quickly and easily into their pockets to reveal what’s behind them. 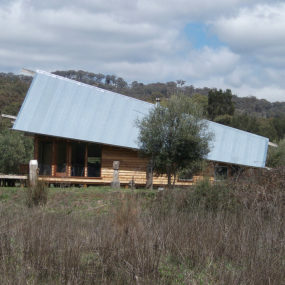 Contemporary architects can make any wishes come true. 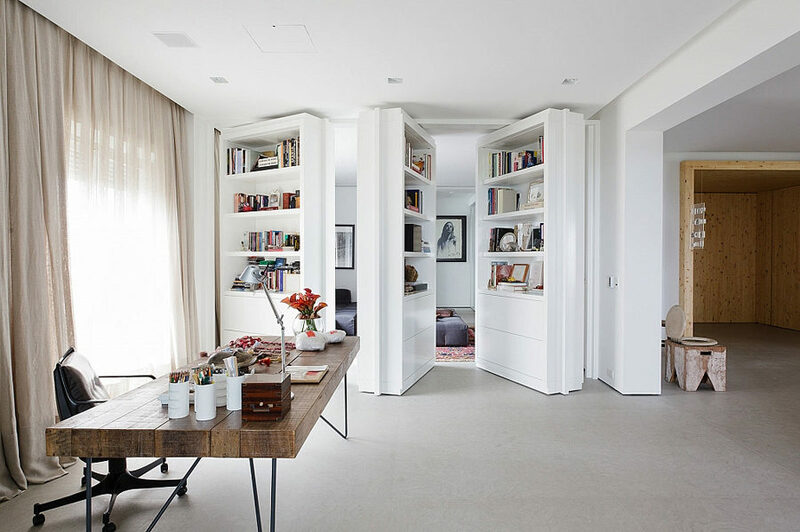 With a good budget and some planning, you can turn your bookshelves into hidden room doors. This is a sweet deal as well, because you get the doors that have a double function. And who doesn’t need additional storage space? Sliding doors come in many forms. Some prefer old barn doors, while others want sleek modern sliders with a hidden mechanism that looks nice and neat. 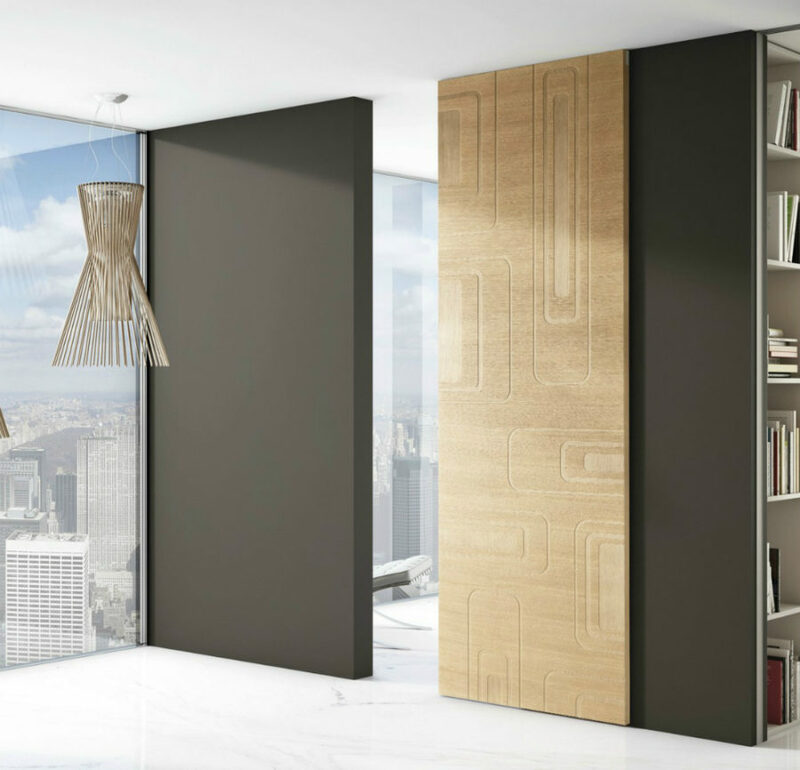 This Less door looks like it’s been inspired by traditional Japanese doors, which makes it a perfect addition for modern minimalist homes. 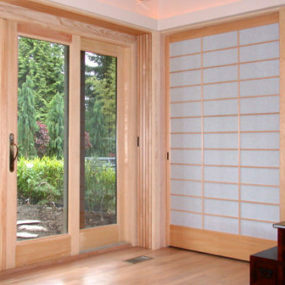 There are indeed plenty of sliding door variations to choose from. Think heavy wooden slabs or thin metal-framed glass panes. Their mechanisms can be hidden as well as the doors can retract beyond walls or be disguised inside them. 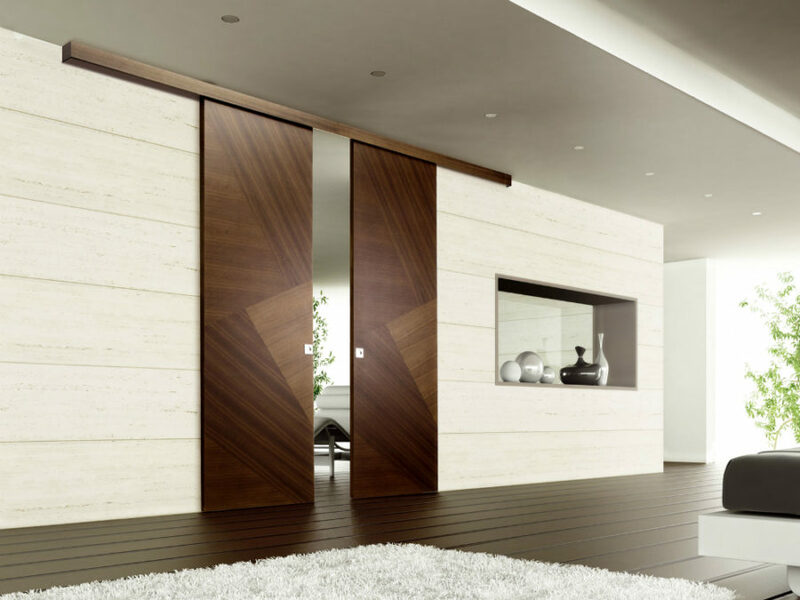 A double wooden door can be a stylish addition to a sleek contemporary room. It will bring a bit of warmth without the rustic vibe to interior, but only if you opt for polished wood. Since wood goes well with everything, you don’t even need to think twice about the design that caught your eye. 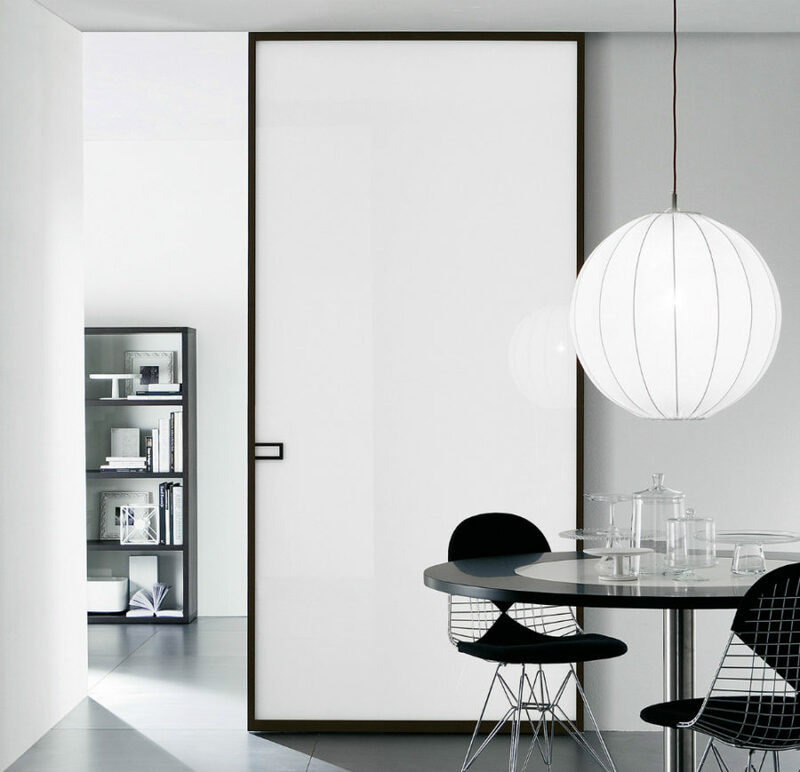 Sliding doors made of plastic, fiberglass, or any other material can be more contemporary-looking. They also come in a rainbow of colors. A black reflective design will make a cool closet or a home office door. With the latter, it will create a sense of professionalism and style. These doors can be slim and thin, but they can also come in wall-sized proportions. With them, you can create entire rooms all the while preserving an open layout. You can literally build walls whenever you feel the need for some privacy or when your friends and relatives are staying over. 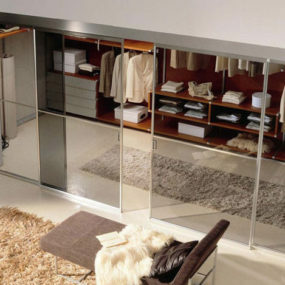 Sliding doors do not require big handles. These can have little recesses that look neat and stylish, tough metallic elements give those recesses a glamorous touch. Glass interior door designs are popular as ever. There are many reasons to use them in modern design. Firstly, they don’t make spaces feel claustrophobic. Secondly, they never look old-fashioned. Glass doesn’t have to be plain. There are tons of glass variations, each of which will bring a unique vibe to your bathroom, closet, or wine cellar. Sliding glass doors are especially in demand, as sliding doors are convenient and space-conscious. Decorative glass can definitely add another layer to your decor. Difference in textures is what makes complex interiors so interesting. 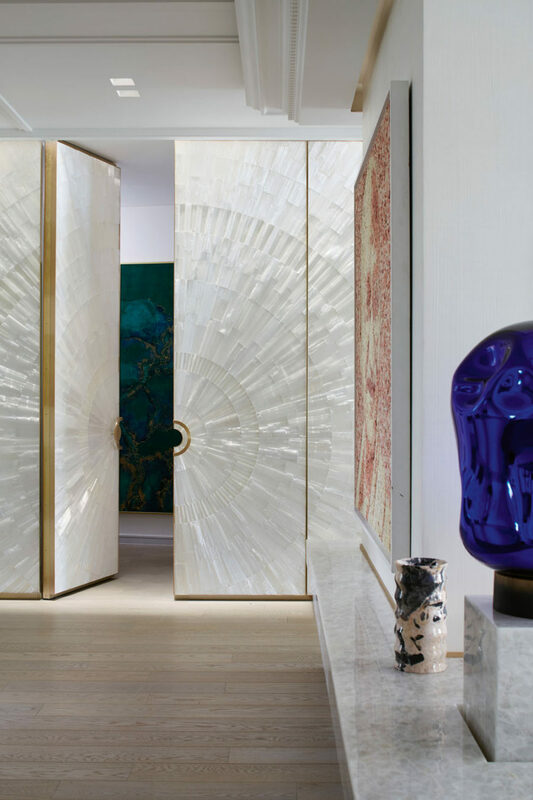 This glass door is particularly exciting because of its linen-like texture that looks unexpected in a marble and metal context. Metal-framed doors are the best. They fit anywhere, and always look stylish. You can use them in bathrooms, bedrooms, living rooms – literally anywhere in the house. Besides, they go well with every style from lofty Art Deco to sleek contemporary. Even barnhouse style can incorporate a metal-framed glass door just fine. 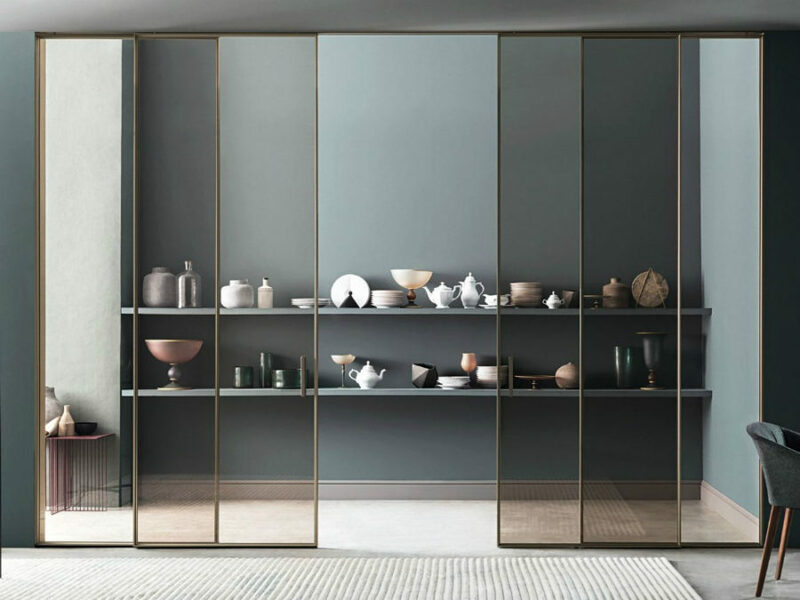 Smoked glass is a modern choice that looks best in monochromatic interiors. It’s a great transition between white walls and black furnishings. 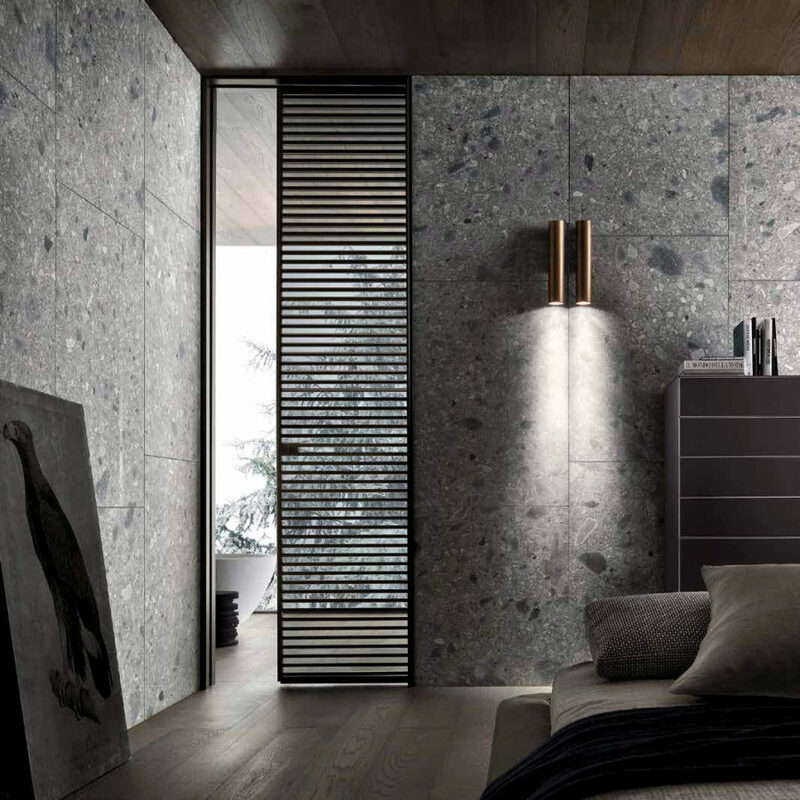 Using smoked glass to create a separate bedroom can also work nicely in a home with an open layout. Wooden doors are a classic, but they don’t have to be plain. There are many new designs made in wood that will modernize any room in the house. 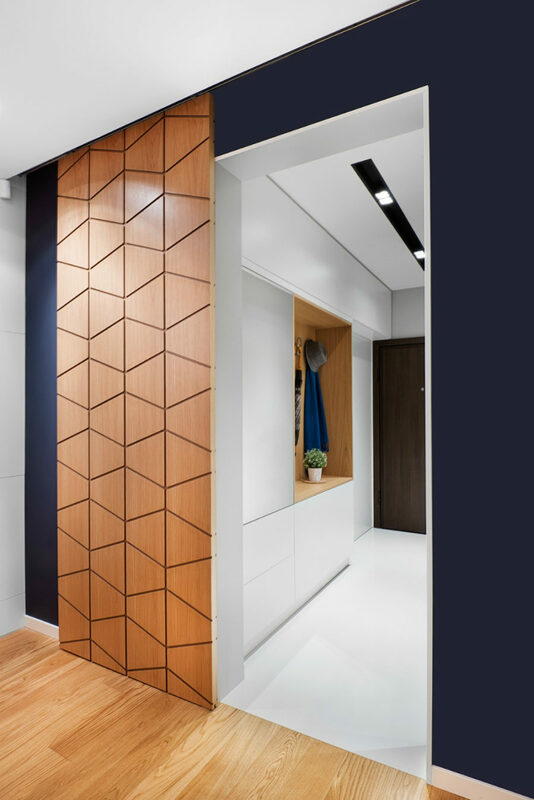 Take a look at this geometrically-patterned door from an apartment redesigned by Fimera. 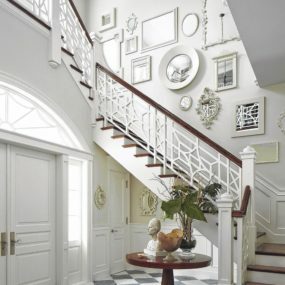 Made of light wood, it goes nicely with the navy blue walls and white hallway interior. You can barely notice the sliding mechanism, so when the door is closed, you may just as well think it a wall design element. Modern carved wood is quite different from what we’re used to. Fila, for instance, doesn’t feel traditional, although it has decorative carvings in it. These contemporary decorations make for a modern atmosphere, while wood provides the familiar warmth to contemporary interiors. 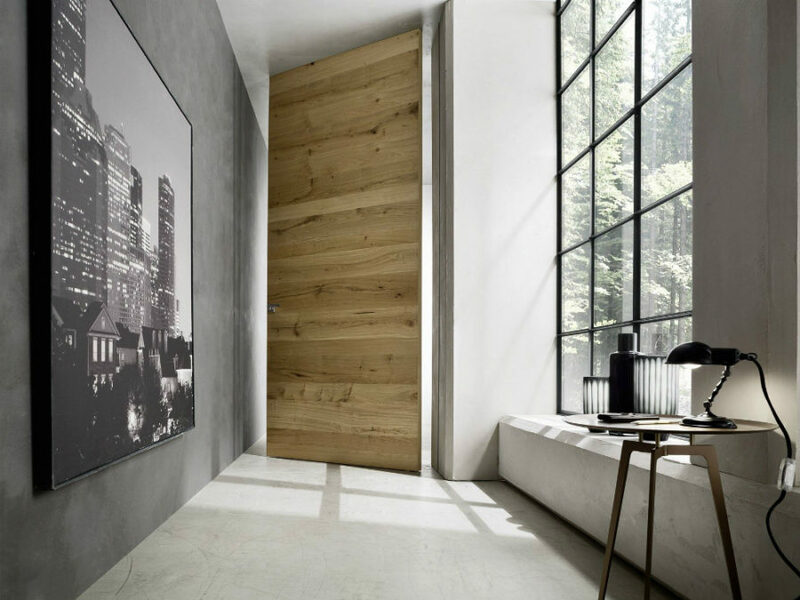 Wood-framed doors can, too, look quite stylish and modern. These look especially designing thanks to their rounded corners. The brown wood fits well with the classic white interior. And the glass panes allow for an open layout atmosphere. 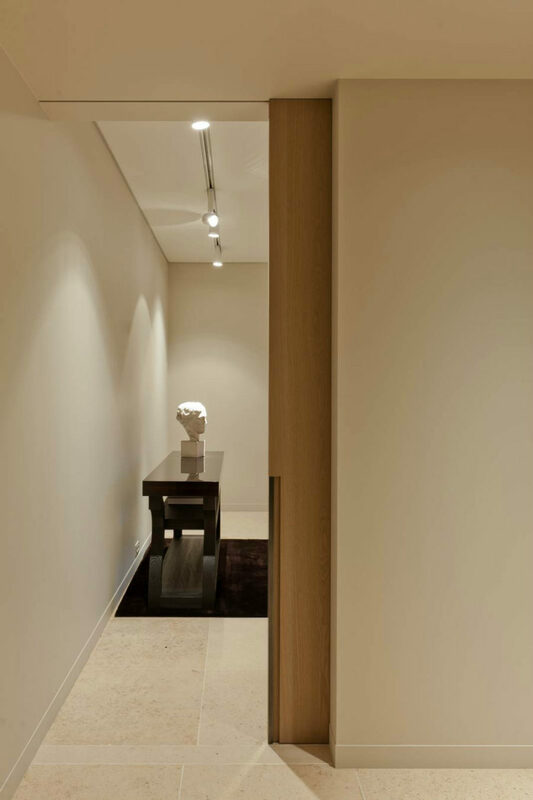 Interior doors aren’t as numerous in contemporary homes because of limitless square feet of open space. 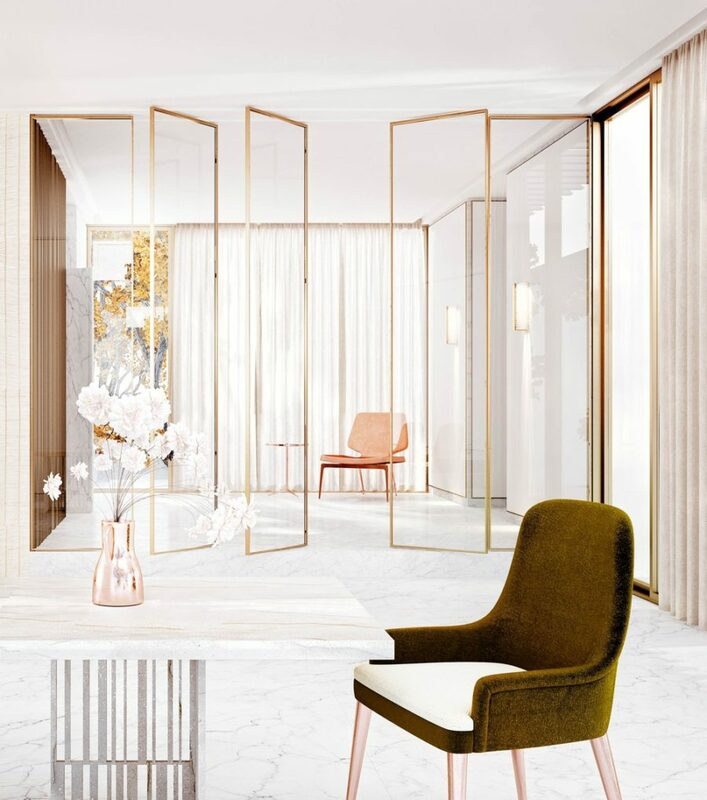 But, say, you have an old house or you want to separate a few rooms from your main area; you can use mirrored doors to keep the space visually open. These reflective doors aren’t only space-enhancing but they also come in a beautiful and trendy rose gold finish. Pocket doors like these fit the walls so well, no one will even know they’re there, and will appear like decorative wall elements. 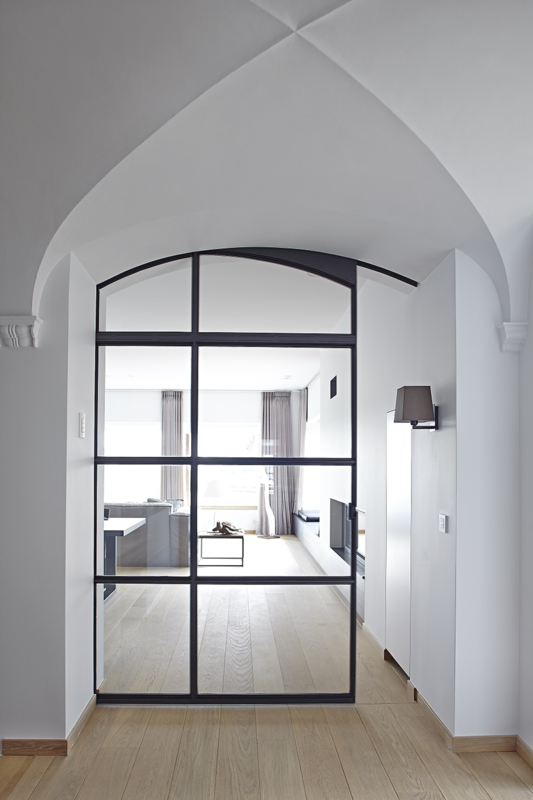 Mirrored interior door designs are a perfect choice for small apartments. You won’t need to buy a separate mirror, and look for a spot for it in a restricted area. They’re also a useful feature for a closet. And can also visually enhance any small room. Mirrored doors can come with decorative elements as well, so you can take advantage of both its reflective surface and floral motifs. 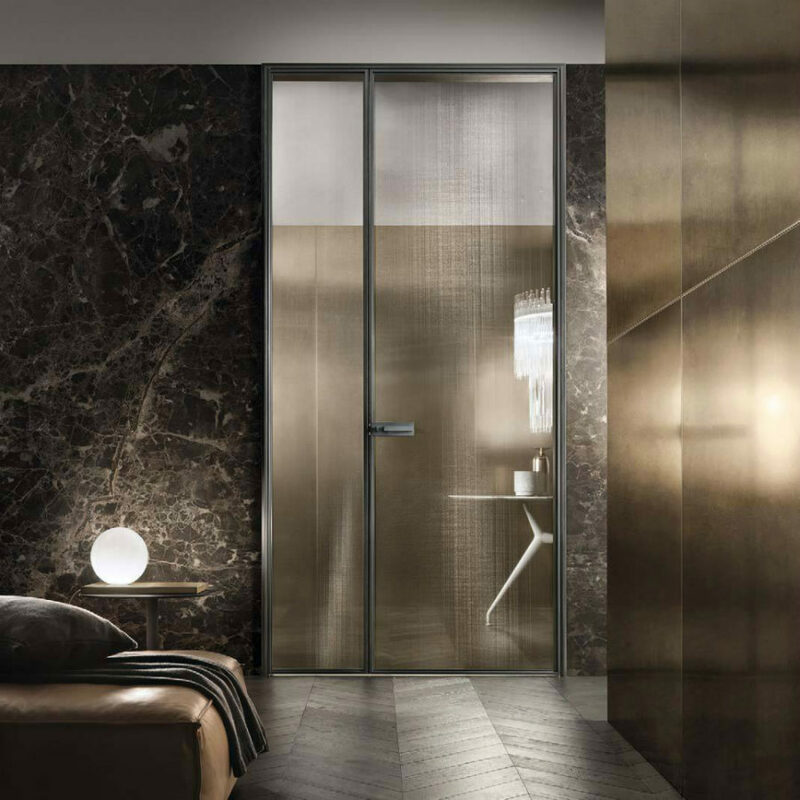 Reflex from Ghizzi & Benatti combines functionality of a mirror with a decorative sliding door in a bit different but no less stylish way. The trendiest of both entrance and interior door designs are the pivoting doors. They can be as wide as walls or as thin as slit windows. 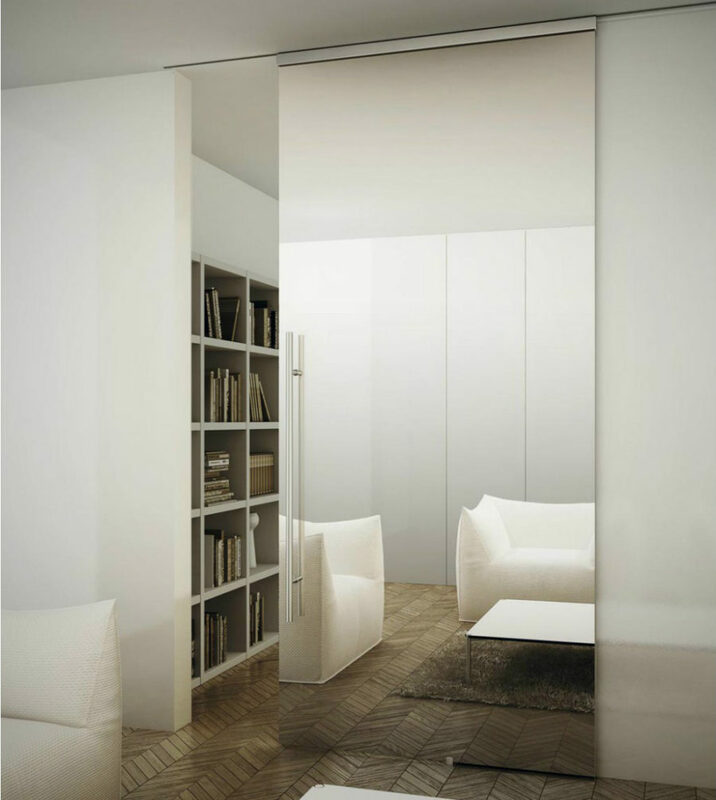 Manipulating your layout is easy with pivoting interior door designs. You just rotate them in whichever direction you need, and enjoy the open atmosphere. These are just as functional as the sliding doors, but are a little more impressive and certainly more dynamic. Metal, wooden, glass, fiberglass – pivot doors easily fit into contemporary homes regardless of the material they’re made of. 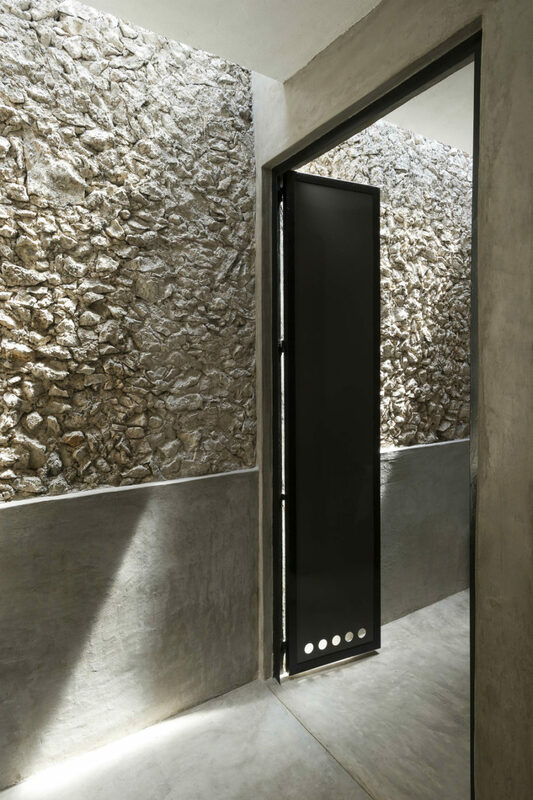 You may argue about the safety and space efficiency of pivoting doors, but their look and operating mechanism are undoubtedly impressive. 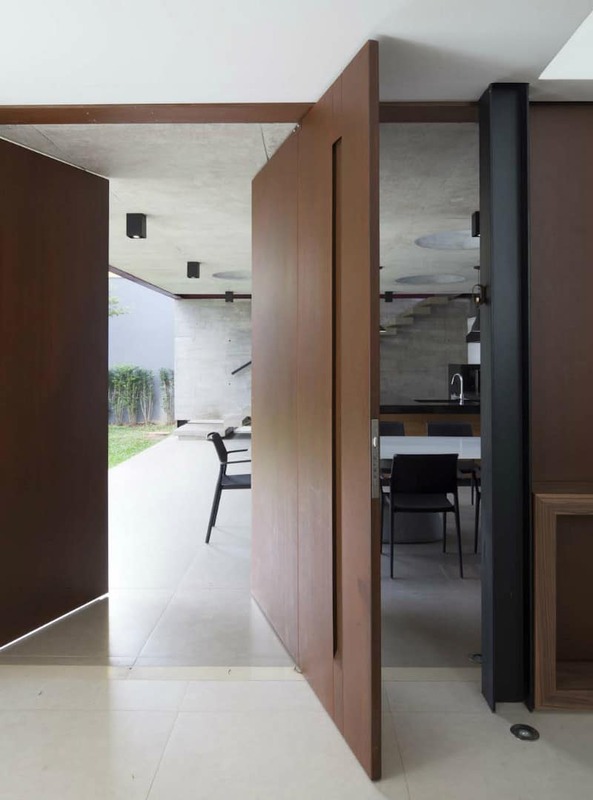 Just like sliding or even hinged doors, pivoting interior door designs can merge with the walls, and appear totally inconspicuous to non-residents. This is a great way to disguise private nooks or rooms like home offices and art and craft studios. 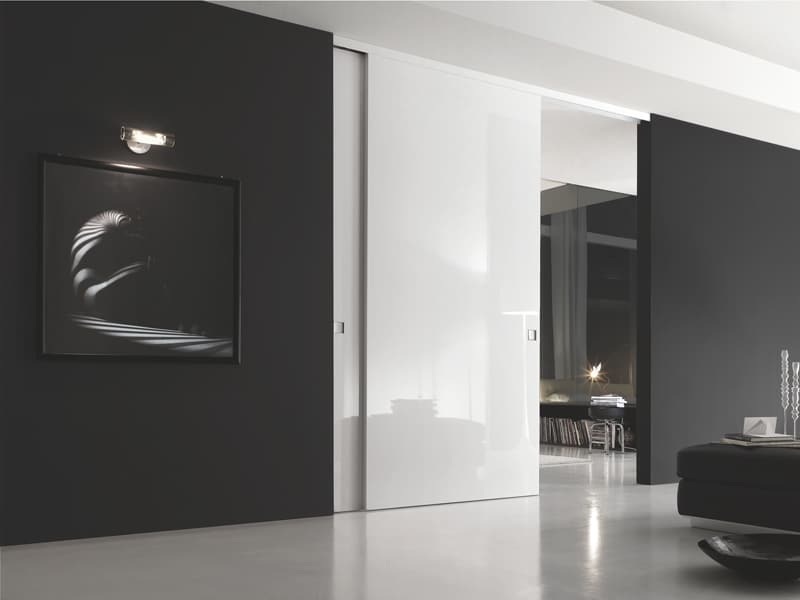 An entire system of slim pivoting doors can make for a beautiful addition to the interior architecture of a modern house. 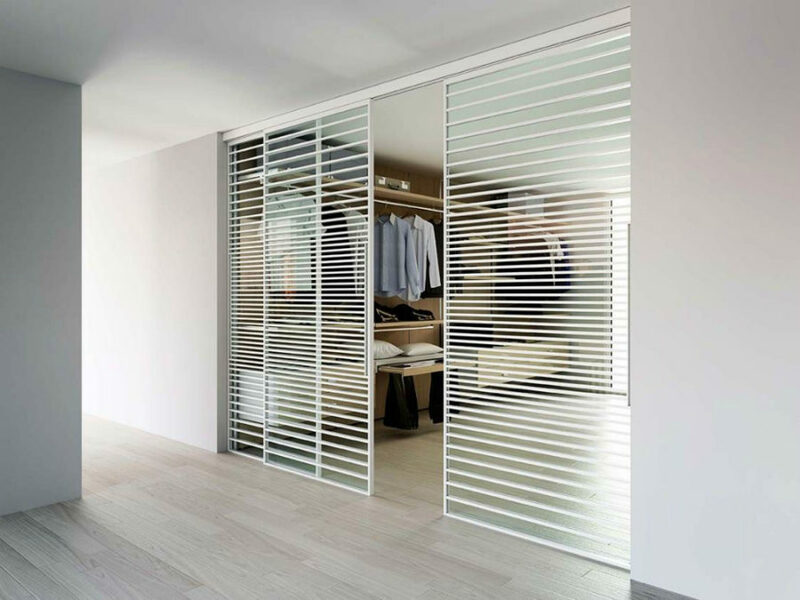 We like how AMR visualized a dressing area behind such a system made of trendy metallic frames and glass. If you are a traditionalist, hinged doors will always be waiting for you on the market, but they may, too, surprise with beautiful and fresh designs. 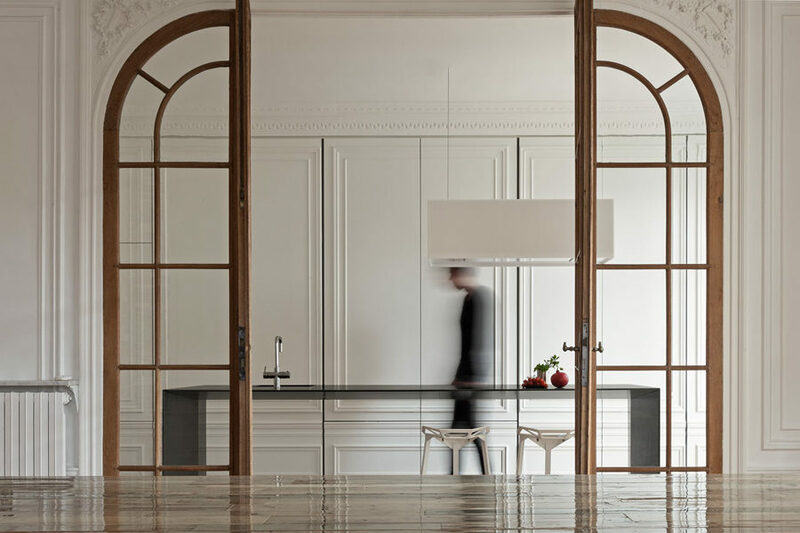 Interior designer Stefanie Coutas simply couldn’t make a better choice for her 19th-century Parisian apartment than this textured glamorous creation of a door. Complex texture and a decorative pair of handles that become one focal point of the design play well into the neutral yet sophisticated interior design. 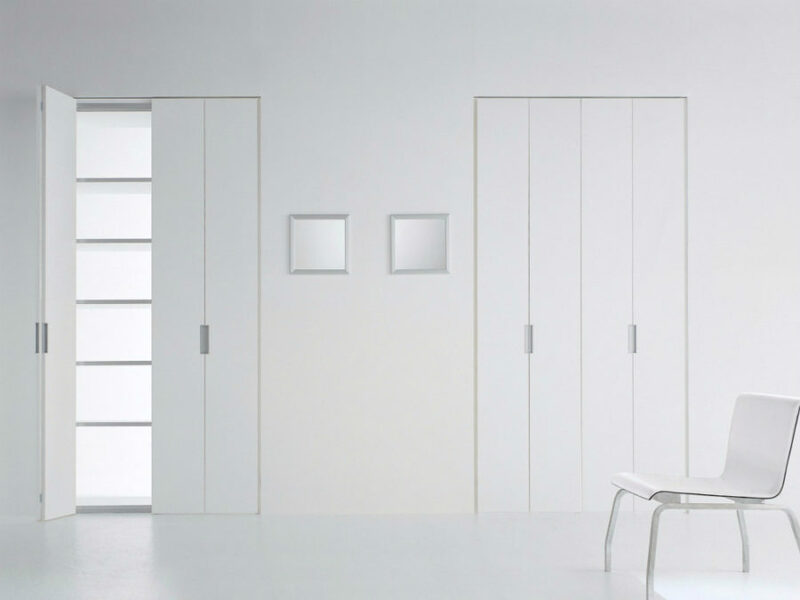 You can also find a compromise between a hinged door and a modern pivot design. Mitika seems like a perfect combination of the two. 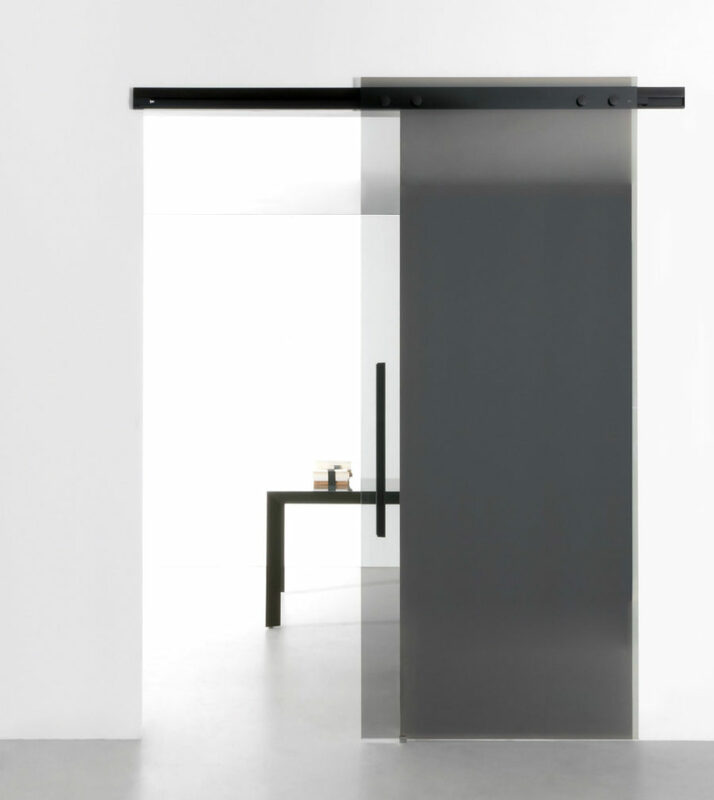 Appearing like a familiar hinged door, Mitika swings and opens widely and elegantly like a pivoting door. What can be more beautiful than veneered wood? RES offers stylish yet quite traditional interior door designs that you can easily use in a modern home. Take one look at Miss, and you wouldn’t want any other door guarding your sleep or protecting your clothes. Modern design approach can produce so many more options in hinged doors alone. 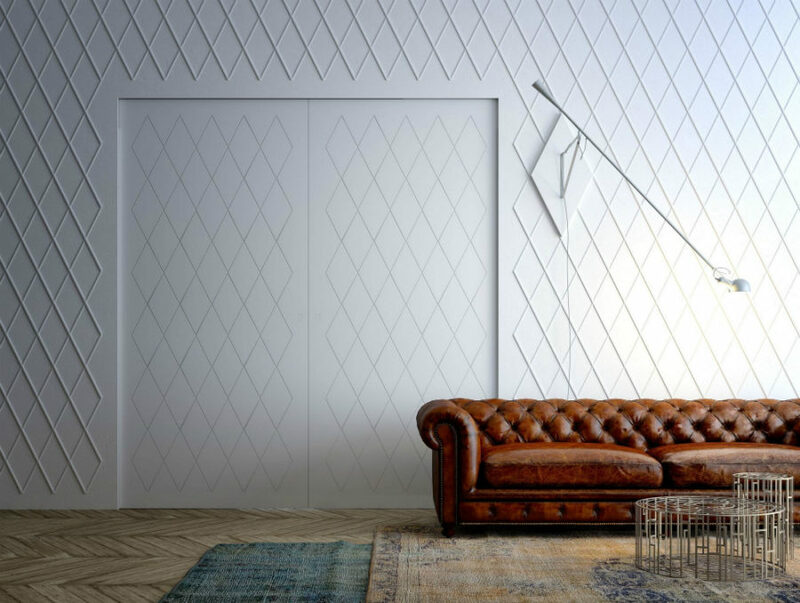 Simple metal sheets can look stylish with a few decorative perforations and the right interior setting. 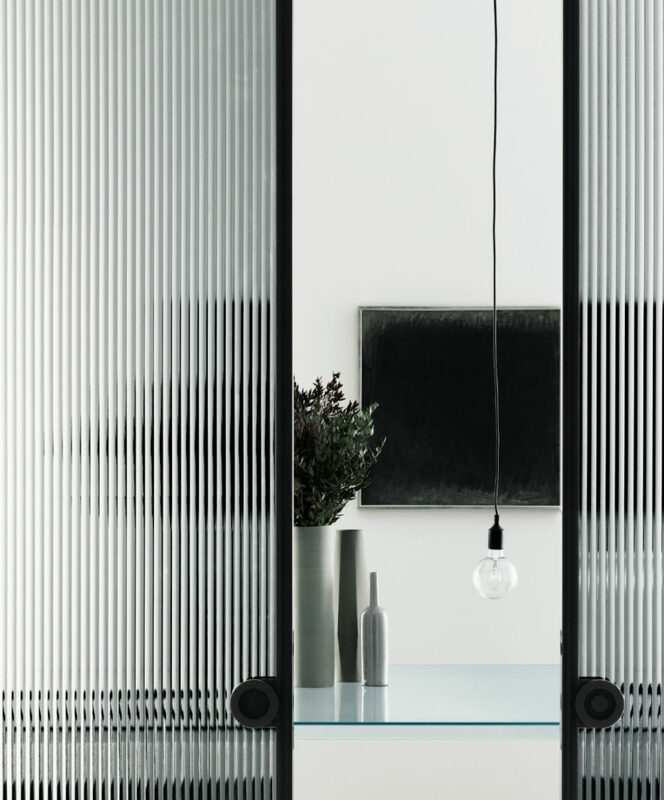 Screens are not so much privacy-friendly as they are decorative. If you don’t want to completely shut out the rest of your house from your room but you also don’t want to feel like a fish in a bowl, then a screen door might just be the compromise you’re looking for. Wooden screen doors have a unique ability to create that cool breezy look. These are great for separate seating areas, dining rooms, and general public zones. They also make cool balcony transitions all the while giving you some sort of privacy. Dividing your room and a dressing area can make for a cleaner overall look in your bedroom. This is where screen doors allow to achieve both the separation and communication between the areas. The same goes for the bathroom. In the case of this last door, it allows plenty of daylight, coming from that glazed wall, into the sleeping chamber. In case you wondered, folding doors are still in demand. And they aren’t just for closets. These add a lot of dynamic to the room without taking up too much floor space. Since they can close and open partially, you can use it to play with the dynamic in your room. You can partially show off your home bar collection as well as totally disguise the laundry closet. 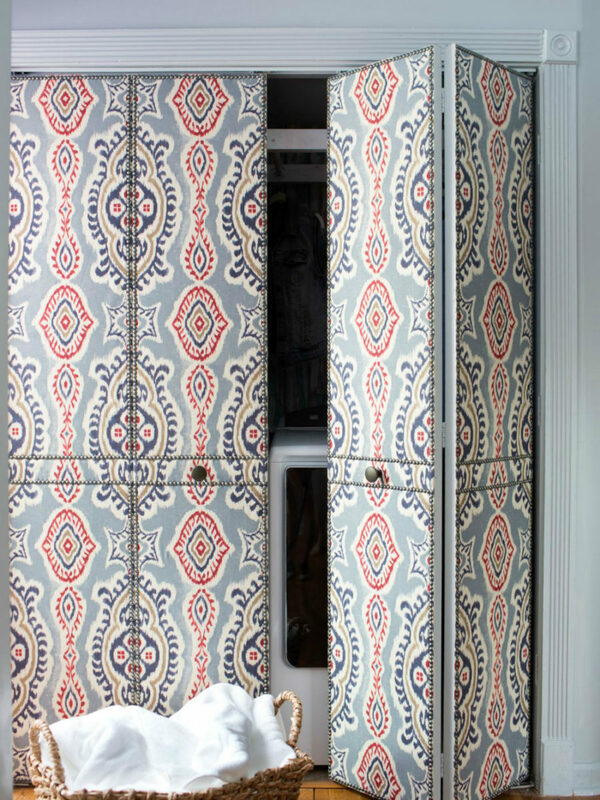 One of the ways that you can make an old folding door look cool again is decorate each fold with upholstery fabric, wallpaper, or Washi tape. 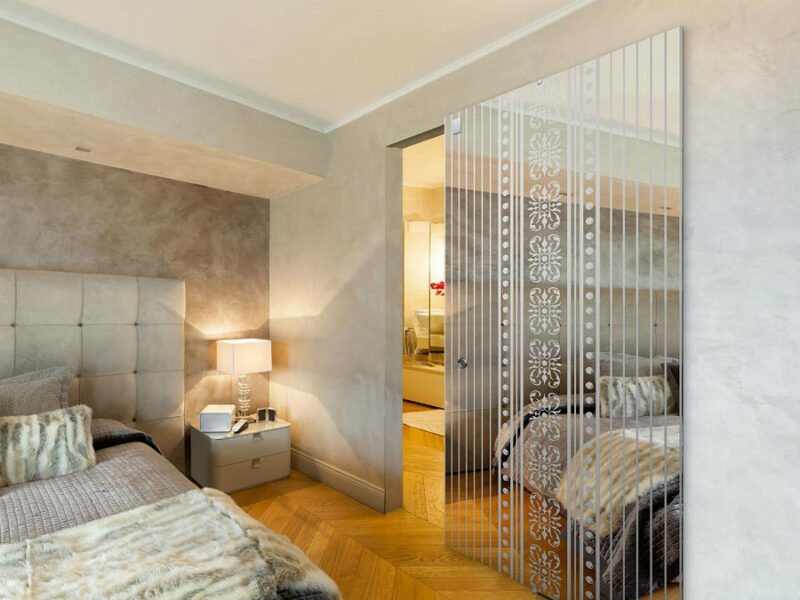 We didn’t exaggerate when we said that metal-framed interior door designs are super versatile, and can look stylish in any shape or form. Just look at all of the different ways they can look. This one even slides. In the white interior, it definitely creates a stark designing contrast that you never want to leave open. The kind of frame it uses is a foolproof choice for any house or room. Very easy to style. All you have to do is fully or partially closed. 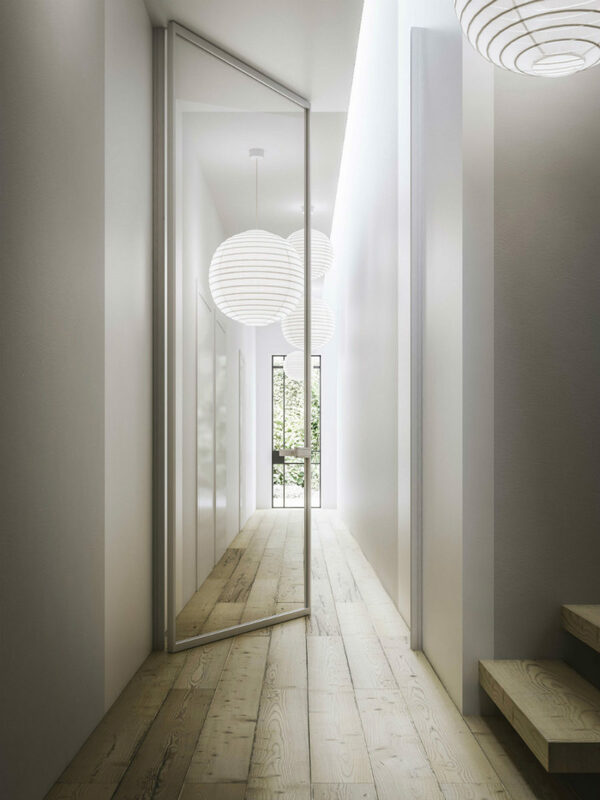 Minimal design calls for simpler interior door designs. Here is one that is both plain and stylish. It will look contrasting whether you leave it open or closed. 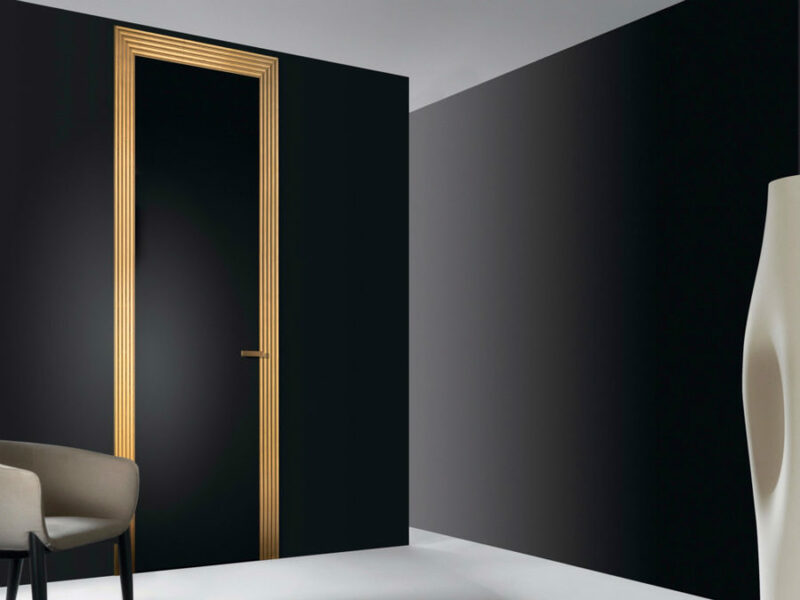 You can use such doors in your office or dining room to the same success, and they will never go out of style. A window pane frame can come in more than one shape. 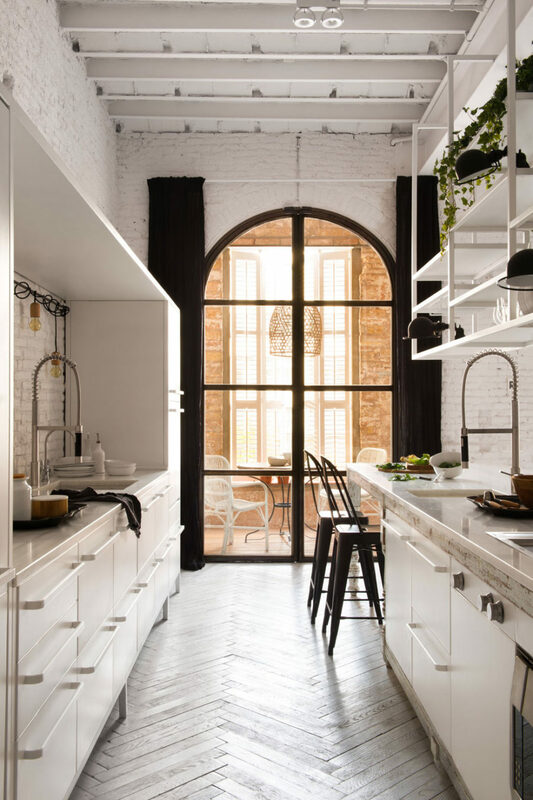 This arched beauty is definitely a focus of this kitchen. It also helps that the interior is almost entirely white. In this particular case, what’s behind the door is no less interesting, and it even gives the glass a yellow tint, which elevates this interior even further. Finally, frames don’t have to be black. Bronzed aluminum looks more than stylish. It’s trendy, beautiful, and different. 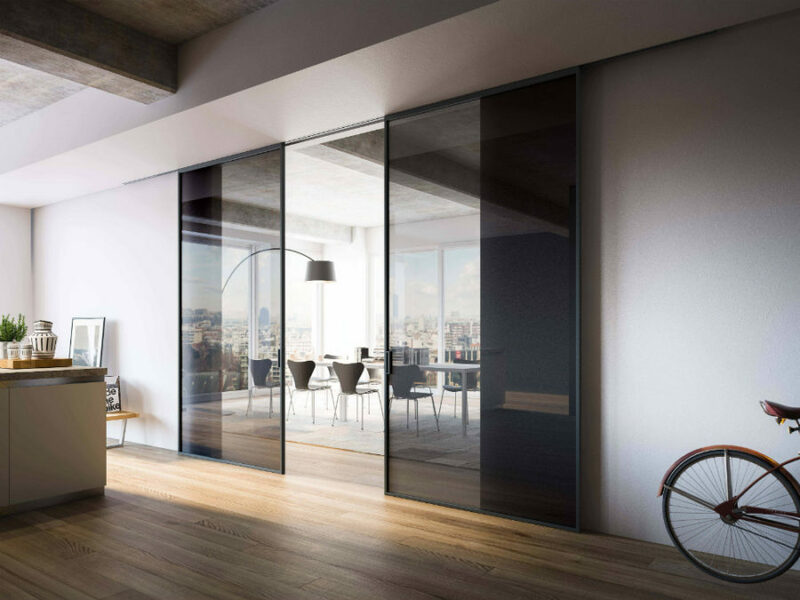 Double sliding doors with a glass frame create a dynamic look, when the doors are partially closed. 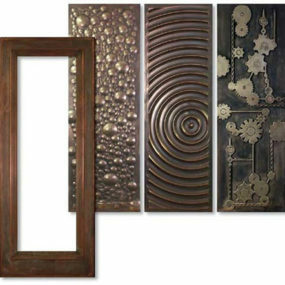 Modern interior door designs are more than just entrances. They can shape and change the interior architecture, and bring a lot more to the design than just a beautiful handle or molding.